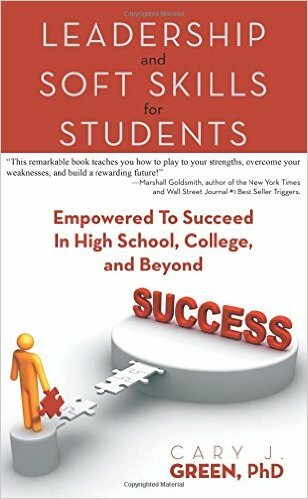 Leadership And Soft Skills For Students: Empowered To Succeed In High School, College, And Beyond by Cary J Green, PhD is the latest book which I have reviewed. Divided into 3 parts – Readiness, Relationship and Results the author brings one through a journey of how these skills can be developed. Cary start of the book making one examine themselves to know more about themselves. What do others see as your strengths and weaknesses and how are you comfortable addressing your weaknesses? Each chapter is written like a workbook where one has to work through and write down what is requested for you in each topic. You start of by focusing on your Strengths, weaknesses, challenges, communication, developing synergies and seeing the results based on what you have worked on. I’m eager to know how I can assist my kids in developing the leadership and soft skills which they require to excel in society. I guess as a parent we want our kids to develop these essential skills for survival and it was great that I got this book to review. Many times students/kids are unable to do well in leadership roles as they lack the relevant skills to exhibit their prowess. They are not taught how to examine themselves, build up their communication skills and other necessary soft skills to relate to others in society. These skills are not readily taught in schools as the focus is more on academic learning based on the current educational system. As a result the kids are at a disadvantage when they start developing relationship with others. They do not understand themselves , thus are unable to relate well to others and lead them. Even though this book is targeted at potential high school kids, tweens it is also good for adults like me who want to revisit and improve on our soft skills. Do get a copy if you too are interested in developing leadership and soft skills in your kids. Books like this are hard to come by, yes there are books for parenting but rarely about leadership and soft skills. It’s good to develop these traits while the kids are growing up. It’s going to help them in the long run.